The range of Pure Sine Wave Inverters available at MPE-Online can be used to convert the DC power stored in a battery system to AC power for use with AC appliances and devices. 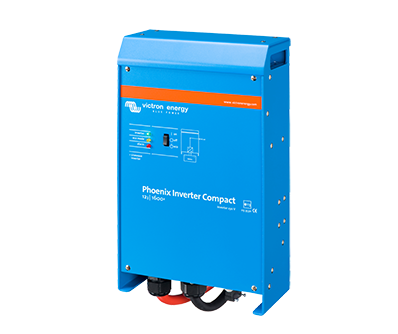 These Pure Sine wave inverters from Victron Energy offer superior build quality and exceptionally high reliability when compared to anything else on the market and are suitable for use in all manner of applications. Victron's 5 year world wide limited warranty demonstrates the confidence that these inverters realise. Pure Sine Wave Inverters are superior in operation and build quality when compared to Modified Sine Wave Inverters and it is for this reason that they can often be more expensive to purchase. Modified Sine Wave Inverters can be used for applications that do not use sensitive electronics or that do not require efficient operation, but MPE-Online would always recommend using a Pure Sine Wave Inverter for trouble free and long life operation, regardless of the application. In general terms, using a Modified Sine Wave Inverter is like driving a car with square wheels!